as an eBook click: Kindle. My one act play Whisper of Wings has been published as an eBook, click here. Il mio Dramma Cajkovskij con musica dal vivo, era presentato al Teatro Dell'Orologio Sala Orfeo, poi al Teatro Comunale di Formello ed al Teatro Cristallo a Bolzano. 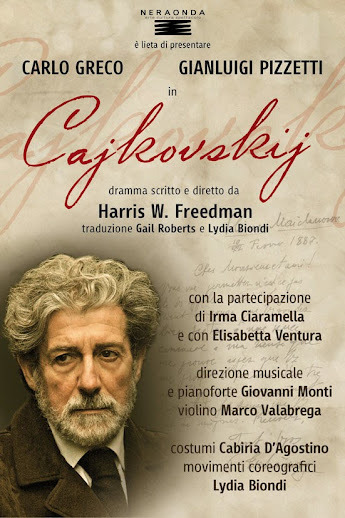 My play Tchaikovsky (in Italian) with live music, was presented at Teatro Dell'Orologio Sala Orfeo in Rome, then at Teatro Comunale di Formello and at Teatro Cristallo in Bolzano. The World Premiere Production of my play, Tchaikovsky, (in Italian) with live music, was presented at Teatro Millelire, Rome Italy. Read the English translations of the reviews here. La Prima Mondiale del mio Dramma, Tchaikovsky con musica dal vivo, era presentato al Teatro Millelire, a Roma. Legge le recensioni qui. 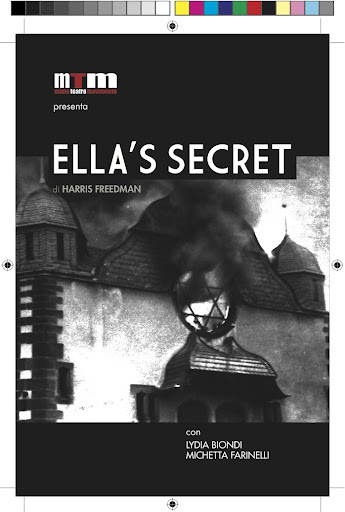 Ella's Secret, (in Italian) was presented at Teatro Millelire, Rome Italy. 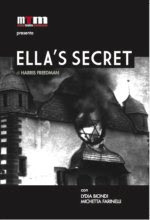 Ella's Secret, dramma, era presentato al Teatro Millelire, a Roma - legge le recensioni qui. 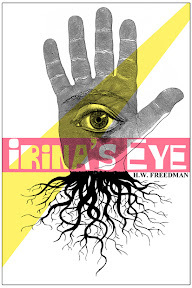 "Spoleto La Mama Fringe Festival 2012, Italy"
Irina's Eye, a novel, published in Paperback and as an E-book. To purchase the eBook click on one of the following: iBookstore, Kindle, Nook, and Lulu.. The Thieves Road full-length play was chosen Stageplay Winner by the 2011 Moondance International Film Festival. The Post Office feature screenplay was an Official Selection at the 2011 Mexico International Film Festival. Southern Justice feature screenplay was chosen Aloha Accolade Award Winner at the 2011 Honolulu Film Festival Awards. Southern Justice, 2010 Canadian International Film Festival Feature Screenplay Winner. Southern Justice feature screenplay, also achieved Semi-Finalist selection in the 2010 RIFF Rhode Island Film Festival Screenplay Competition. Selling Off feature screenplay, achieved Finalist selection in The Ace Fest 2010 Great American Screenplay Competition, and Honourable Mention at the 2010 Amsterdam Film Festival. A Minute of Silence feature screenplay, achieved Semi-Finalist selection in the 2010 Slamdance Screenplay Competition. Something in Common feature screenplay, achieved Quarter-Finalist status in the 2010 Writer’s Network Screenplay & Fiction Competition. See below for additional Awards. Harris holds both British and American passports. Theatre: Several of his full-length plays have been produced in the USA, UK, and Italy including, Cajkovskij (Tchaikovsky) (Teatro Dell'Orologio Sala Orfeo, Roma, Teatro Millelire, Roma and Teatro Cristallo di Bolzano, Directed by Harris), Ella's Secret (Barons Court Theatre, London, directed by Edward Davies. Teatro Millelire, Roma, Spoleto La Mama Fringe Festival, e Teatro Dell'Angelo, Rome Italy, Ethnic Cultural Theatre, Seattle, Washington, USA, Directed by Harris), Selling Off (John Houseman Theatre, NYC, Directed by Gene Feist); Peanut Butter and Jelly (University of the Streets Theatre, NYC, Directed by Harris and starring Michael Moriarty in his NYC stage debut), There Aren't Any (NYC, Directed by Harris); Moscow Shadows (The New End Theatre, Hampstead, London, Directed by Philip Grout); A Minute of Silence (Upstairs at the Gatehouse, London, Directed by Harris); A Minute Of Silence achieved finalist status in the New Century Writers Awards and semi-finalist status in the Julie Harris Playwright Award Competition administered by the Beverly Hills Theatre Guild; Something in Common (Assembly Room Theatre, Edinburgh Fringe Festival, and Warehouse Theatre, Croydon, London, both productions were Directed by Harris). Also a short play, Lunch With Sandy (The Machine Room Theatre, London, Directed by Emma Benson). Harris directed a staged reading of The Family Jewels at the Criterion Theatre, Piccadilly Circus (West End). The Family Jewels achieved finalist status in the Sonoma County Repertory (California) Play Competition. Harris also directed a staged readings of Tchaikovsky at the Tristan Bates Theatre in Covent Gardens, London, and The Thieves Road in Italian at Teatro Argot Studio, Rome, Italy. Harris is a member of The Dramatists Guild NYC, Society of Authors UK, English PEN and SIAE Italy.